Rock the Block, November 24: For many of the couple of thousand people who attended over the day, Archie Roach’s heart-wrenching performance of “Took the Children Away” was a highlight. 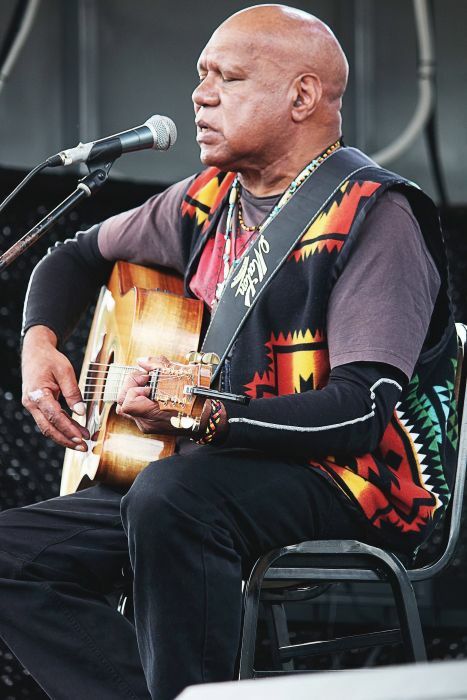 The poignant words of the song contrasted with shrieks of delight from the young Aboriginal children who slid down the giant inflated slide or drenched one another with super-soakers around the barriers in the wet play zone down the hill from the stage where Archie was singing. Earlier in the day, following a Welcome to Country by Uncle “Chicka” Madden and welcome from the Aboriginal Housing Company chairperson Alisi Tutila, Deputy Mayor Linda Scott and Tanya Plibersek MP also spoke, interspersed by songs from Marlene Cummings. The final speakers on the day were a formidable line-up of Elders who have mentored generations of Aboriginal families in Redfern – Aunty Norma Ingram, who helped establish Murawina preschool on The Block, Uncle Shane Phillips, the EO of Tribal Warrior, Aunty Millie Ingram, chair of Wyanga Aboriginal Aged Care, and hospitality educator Aunty Beryl Van-Oploo.